Artists are supposed to know their place. A painter paints, a sculptor sculpts, a composer composes (writers, alas, often get lost in a slew of genres because words are promiscuous). When a painter, say, practices an artistic discipline separate from the one he or she is known for, the viewer and even the presumed expert may become suspicious, resentful of the demands on their attention. You can’t be serious, they insist. But they should trust the artist. If they already admire the painting, then they should trust the sensibility and intelligence that produced it. Their experience of that artist’s other practice will, in all likelihood, enlarge and inform their view of the painting. It was not until he started constructing the Machine in 1979 that Llyn Foulkes found an entry through music into the kinds of dimensions that he had been discovering in painting. If you were simply to catch a glimpse of his Machine without venturing further, you might say that it looks like a fantastic African fetish object, an entire junk-shop window, some sort of great turtle’s carapace; it is indeed a home, a life, a village orchestra inhabited by one man. Talk about the soul of a new machine. Faced with the implicit power of expression built into this marvelous instrument, art audiences have tended to pass it over as a novelty act. It does have roots in the sound effects of novelty music, but that is just a small part of its arsenal. All that Foulkes has gathered in a lifetime of listening and playing, the pleasures and frustrations both, along with his engagement in the process of making art and his rage against the deceptions of the art market (and much else), gain outlet there. The Machine might be the ultimate assemblage, so invested is it with the personality and experience of its maker. In retrospect, the lines leading up to his invention seem clear. There was the influence of Spike Jones, who inspired Foulkes at the age of eleven to devise a similar rhythmic contraption festooned with horns and bells; he soon formed a band to entertain local audiences in Yakima, Washington. He learned to play the drums in high school and in the orchestra there played timpani as well. Hearing Benny Goodman’s quartet, and especially Lionel Hampton on vibes, he also grew interested in the xylophone. 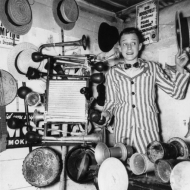 Eventually he came upon the folks who influenced Spike Jones, the more musically substantial Hoosier Hot Shots; Paul “Hezzie” Trietsch’s versatility on his own washboard plus horns and bells was not limited to mere theatrical effects, as in Jones. Later, from 1965 until 1971, while raising a family and teaching at UCLA and with a rising profile as a painter, Foulkes played drums in the City Lights, a rock band that appeared at clubs on the Sunset Strip alongside the Doors and the Byrds. Though appreciated for his unusual approach to the drums, he was no great enthusiast of rock, but the dynamics of the music led to a decisive break in his perspective, which occurred around the same time as a comparable break in his painting. Quite simply, music had gotten too loud, obliterating all sense and clarity of sound. He saw how the guitarists would crank up their amplifiers ever further, using bigger amps and adding distortion in order to hear themselves against one another; as a result, to ensure that the drums could be heard in turn, he ended up using sticks so big that his hands would bleed. In jumping off that train, he looked back to his roots and began to build a precursor to his Machine. He also took cues from his father-in-law, the Disney animator Ward Kimball, whose popular band the Firehouse Five Plus Two played old-time music. Kimball introduced him to the music of the Cheap Suit Serenaders, fronted by the cartoonist Robert Crumb, and before long Foulkes was playing his contraption with members of that unit when they visited L.A. They decided to make a record together, as Llyn Foulkes and the Rubber Band, and Crumb even did the cover, but the record never came out. Foulkes assembled a new group, however, playing mostly his own songs, and by the mid-1970s the Rubber Band landed on Johnny Carson’s Tonight Show. They were then offered a two-week residency on the show while Doc Severinsen was on vacation, but personality clashes kept them from seizing the chance. By the time the group broke up in 1977, Foulkes had other ideas for using the horns, drawing more on jazz, and above all he was ready to go it alone. The Machine is a quantum leap in the tradition of one-man bands, for its well-calibrated complexity as well as for his vision of what it might do. To this day, he continues to refine its elements. His old collection has blossomed into an arrangement of nearly three dozen car and bicycle horns, spanning several octaves, perched in front of him. To his right sits a xylophone, covering a similar melodic range, and below the horns, stretching the full sweep of his left arm, a rack of pitched cowbells is laid out. All these he plays with light mallets. A tom-tom, a snare, and a bass drum he plays with his feet, using pedals that are also hooked up to cymbals. His left heel, meanwhile, may trigger several organ pipes fitted with bulbs, and his right heel sometimes works the kick drum, in the form of a microphone that produces a well-placed thump when struck. Add to that his right foot’s main task: a low electric bass string rigged horizontally, on which he stamps forth the notes with remarkable precision. With his hands or sticks he can reach other sound makers, including an empty five-gallon plastic water jug that serves as an additional drum. Finally, there is the flexiphone, hung around his neck. Simple in form and far more resourceful than it would seem, it is his own invention, inspired by the slide whistle that Hezzie used to wield. It comprises a clarinet reed and mouthpiece attached to a flexible, retractable tube, with the bell of that instrument attached to the other end. Again he has attained impressive fluency on it, with runs that recall the surprising leaps of Eric Dolphy on bass clarinet. When the flexiphone joins the bicycle honkers, his horns together swing as wildly as Sun Ra’s reedmen. All in all, the four limbs working away in their finely choreographed manner may well sound like a small ensemble of musicians having a grand time (“Take it away, boys,” he calls out before an instrumental break). When he plays, Llyn Foulkes is every bit a part of the Machine, his body built right into it. Foulkes is an old song-and-dance man steeped in irony; the Machine is his little theater. What am I gonna do when the clock strikes three? What am I gonna do when they come after me? Foulkes is so committed to his music that he created his own venue: a performance space known as the Church of Art, adjacent to his studio near downtown L.A.; he has been there, living upstairs, since the late 1990s. When he built his Machine in the tiny basement of his house in Eagle Rock, one challenge in its elaboration, naturally, was how to make it so that he could take it apart and haul it in his van for the occasional gig. He played it in Topanga, and once with an orchestra, but the openings at art museums proved a trial in frustration, with his music ending up more an appendage to the general circus. Nonetheless, having a stage at the Church of Art did not initially mean that it was all about the Machine. He put on events there and involved people in various sound happenings, until experience taught him to focus. In the past decade, it has become a space for his own music. And certainly the music has evolved. After so many years, Foulkes feels that he’s learning to play the songs better and to go deeper into them musically. In 2004 he put out his first CD, Llyn Foulkes and His Machine. Featuring seven of his songs performed live at the Church of Art, the record bears repeated listening to appreciate how he animates a musical narrative, tapping the colors and accents from his instrument to fill in the spaces, to add light and shading. One can hear, as well, his unabashed pleasure in playing the Machine, the flights that carry him off between verses of a song. A few years later, Foulkes began leading Tuesday night improv sessions at the Church of Art, with a core group of artist-musicians. Departing from the familiar scenarios of the songs liberated him to explore the wealth of sounds at his disposal. “All I’ve been doing,” he told me recently, “is trying to play [the Machine] better and find out what it can do. And it can do a lot! When I started getting into the improvisation, all of a sudden I started realizing, my God!” One regular collaborator, Norton Wisdom, has been doing painting performances with Foulkes and his Machine since the 1990s; they played the opening of Nine Lives: Visionary Artists from L.A. at the Hammer Museum in 2009 as well. A new CD, Sounds from Bldg 22, presents improv sessions from 2010 in which Foulkes is joined by Mike Roof on theremin and a bit of organ, Bruce Gray doing mouth sounds, and Stosh Machek scatting. The improvisations stretch his music wide open—and still it swings. Even so, he keeps coming back to the old songs that have remained true to him, their caustic commentaries undimmed. In all the performances that he gave at Documenta 13 in the summer of 2012—recordings on YouTube—his wonderfully savvy L.A. cabaret is alive and well. It doesn’t matter what critical armature is used to define these performances (preferably none), Foulkes is energized by the public, which in turn is all eyes and ears and big, knowing smiles.